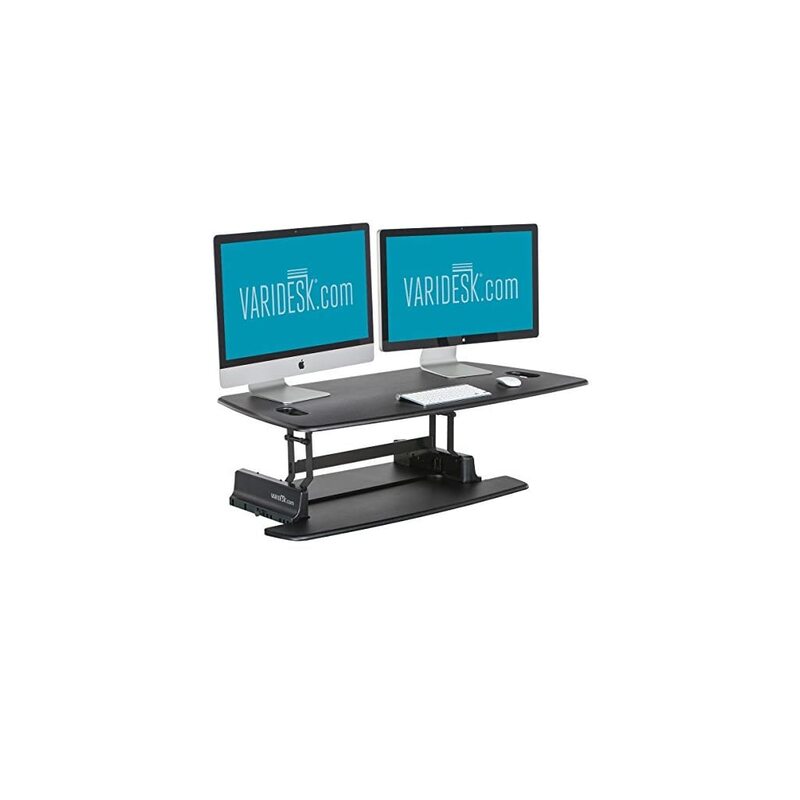 Ergonomic Height Adjustable Standing Desk, Electronic SIT-STAND Desk (Black frame) Includes FREE Cable Tray! Table Top available in lots of colours and finishes. New taller height – Easily adjusts from sitting to standing with a smooth crank adjustment from 63.5 – 99cm (lower surface) and 75.5 – 110.5cm (upper surface). 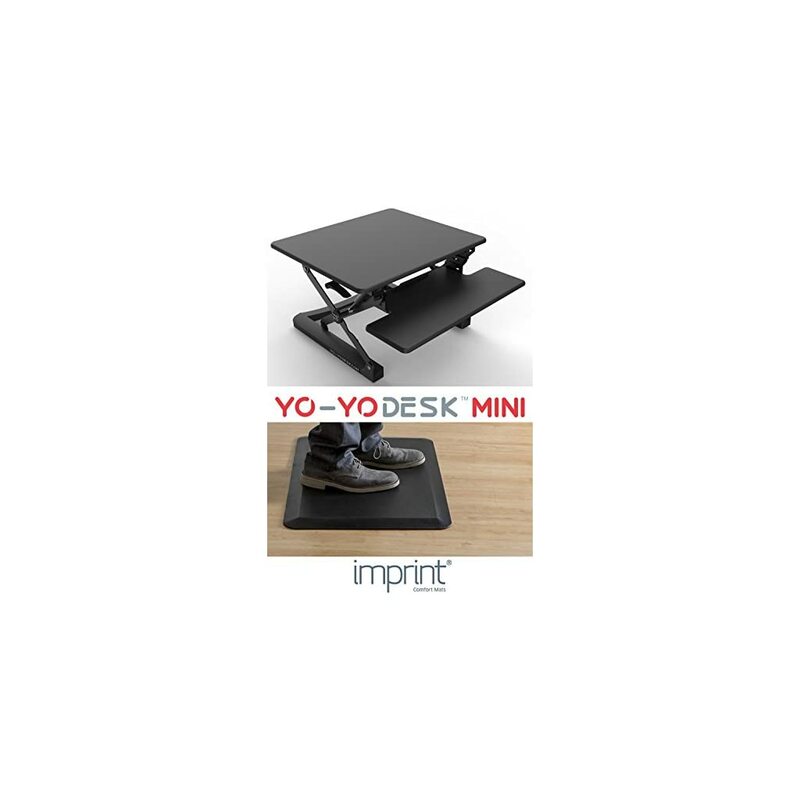 Bundle Offer – Save £30 : Yo-Yo Desk Mini with Standard IMPRINT CumulusPRO comfort mat. Best Selling Height Adjustable Standing Desk [68cm Wide] with award winning Standing Desk Anti-fatigue Mat. Perfect standing desk bundled solution. 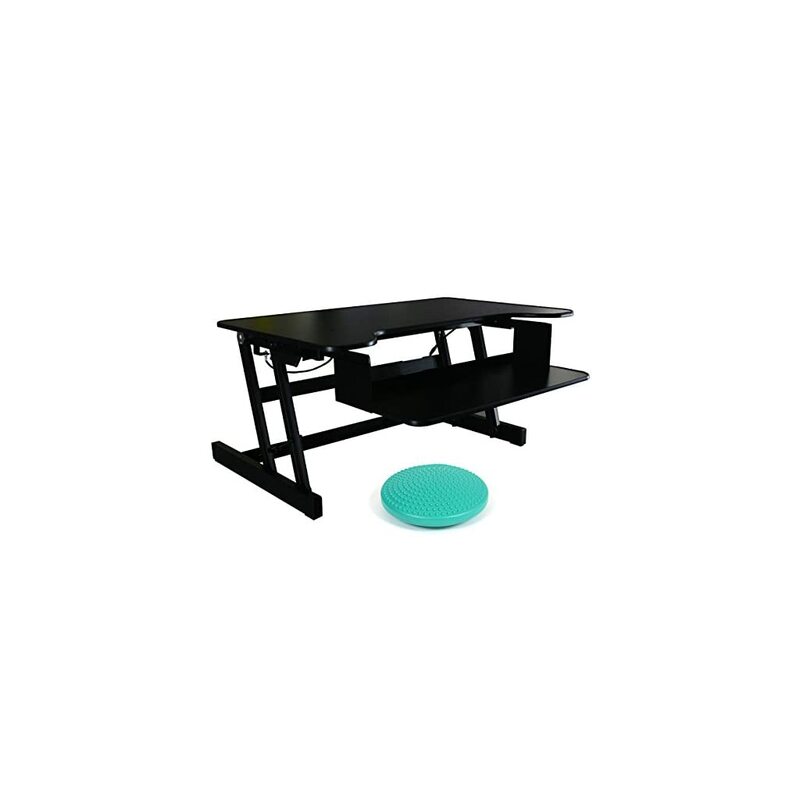 Yo-Yo Desk sit-stand desk converter for easy and fast switching from sitting to standing. To encourage maximum movement and comfort whilst standing, experts recommend IMPRINT CumulusPRO standard professional grade anti-fatigue standing desk mat. 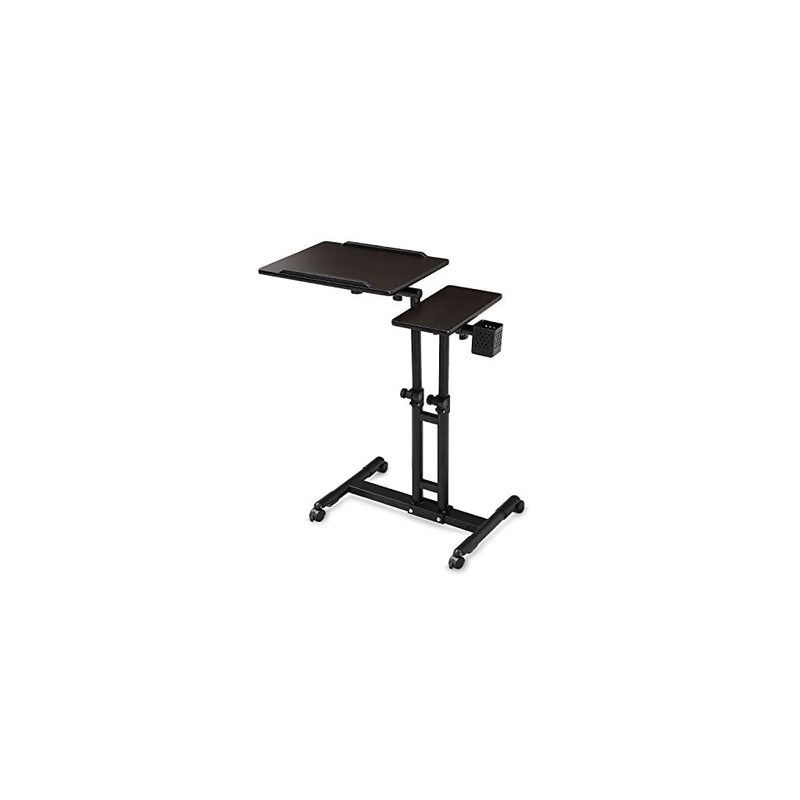 Height adjustable desk range: 50cm (Desktop) 36cm (Keyboard). 15 options for smooth height adjustment from sitting to standing desk. Split level worktop 68 cm wide. 3-year Warranty. 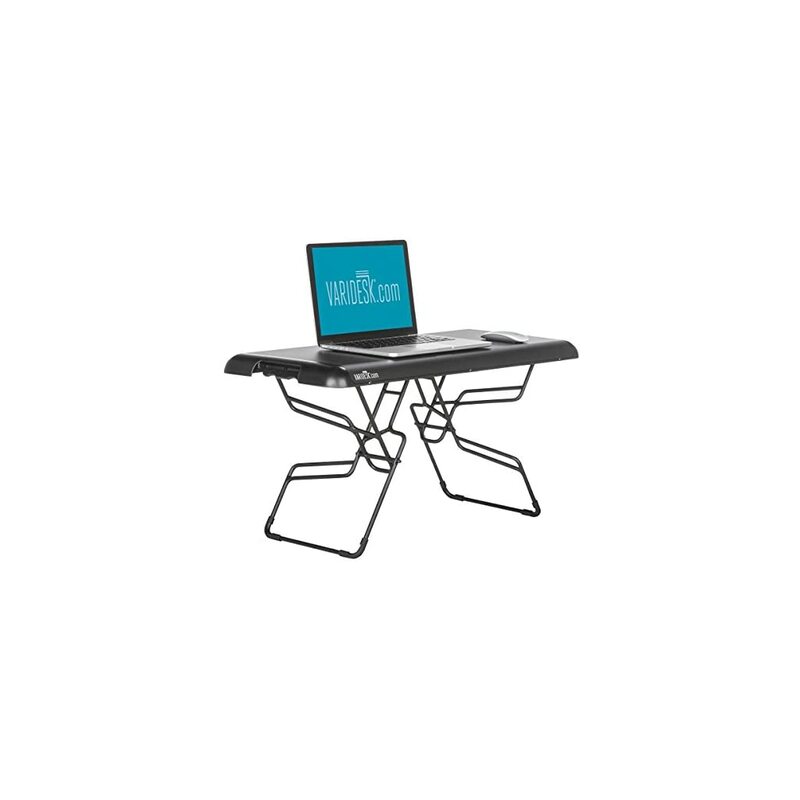 Gas Spring Sit-Stand Workstation – premium grade aluminium gas spring for smooth height adjustment. IMPRINT CumulusPRO Standard Professional Grade mat is slightly more softer cushioned than the Deluxe Commercial Grade version. Mat Dimensions: 50.8×1.9×76.2cm. 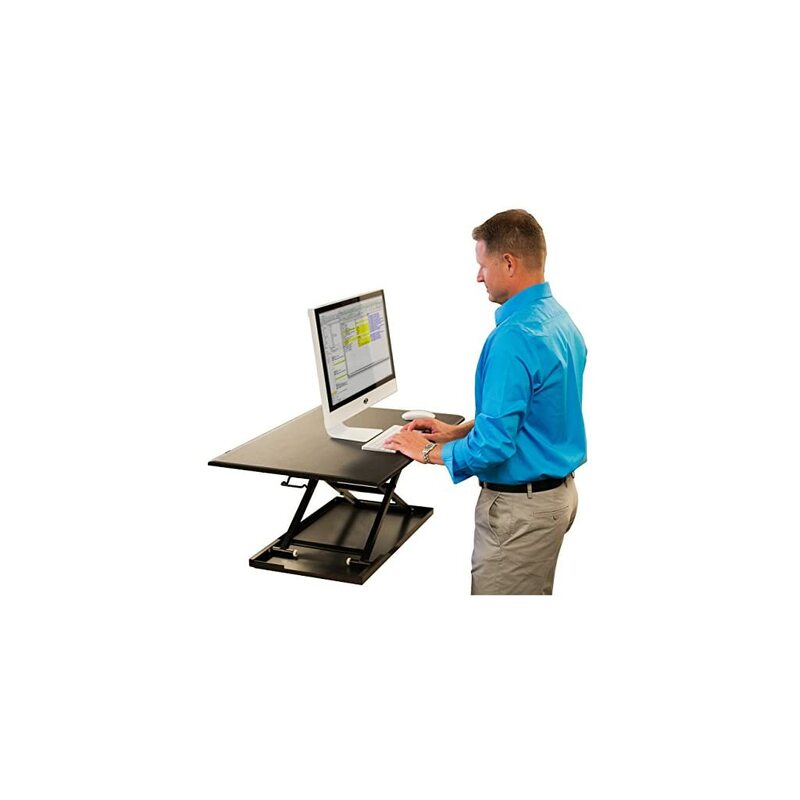 Made with Cushion-Core Technology to reduce fatigue and increase comfort and productivity when working at a Standing Desk. Smooth and Stable Movement: gas spring hovering system allows the workstation to smoothly adjust for sitting or standing with just squeeze the handles on each side. Large Work Surface, Wide Keyboard Tray: offer a deep, wide surface. There’s room for your work materials and enough space to put your monitor at a comfortable reading distance. 1.Smooth and Stable Movement: FlexiSpot’s gas spring hovering system allows the workstation to smoothly adjust for sitting or standing with just a light squeeze of the handles. 3. 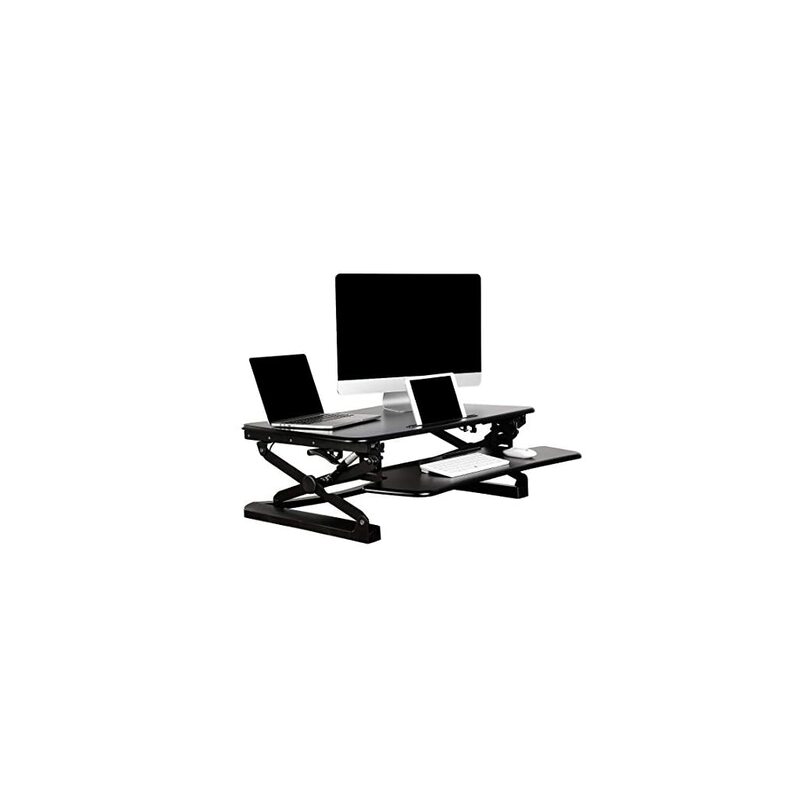 Straight Up and Down Movement: Our workstation rises and folds vertically, within its own footprint. There’s no need to make spatial accommodations, as may be required in comparable products. 1. 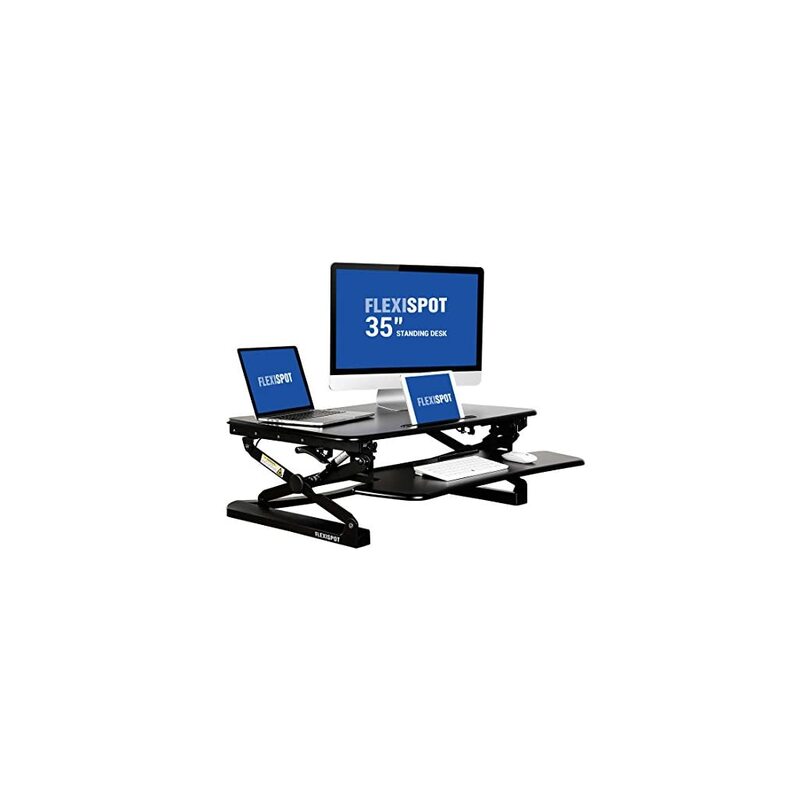 Smooth and Stable Movement: FlexiSpot’s gas spring hovering system allows the workstation to smoothly adjust for sitting or standing with just a light squeeze of the handles. 2. 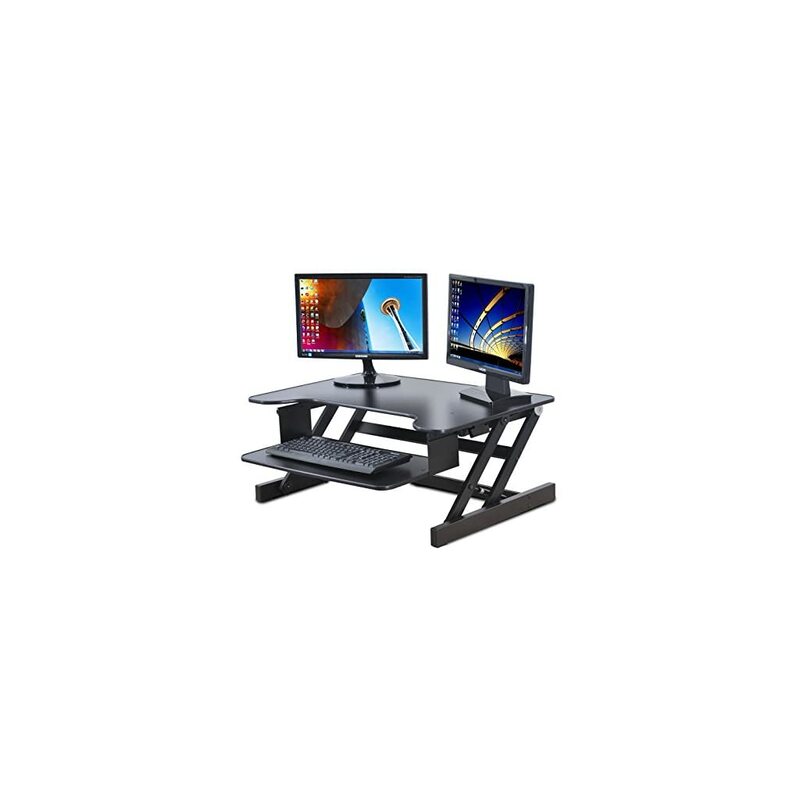 Straight Up and Down Movement: Our workstation rises and folds vertically, within its own footprint. There’s no need to make spatial accommodations, as may be required in comparable products. 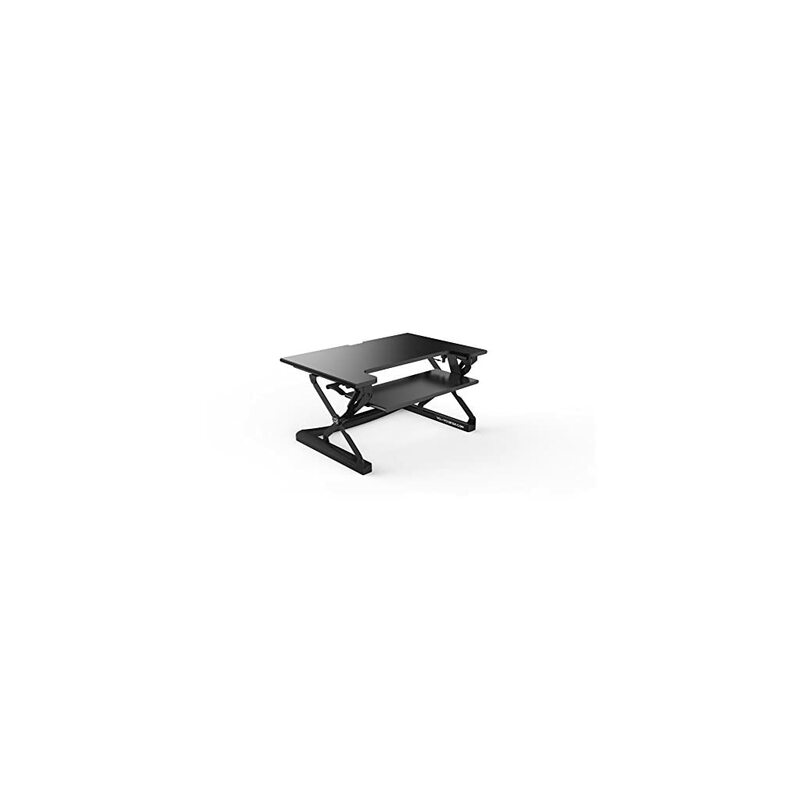 Height adjustable desk range: 50cm (Desktop) 36cm (Keyboard). 15 options for smooth height adjustment from sitting to standing desk. Split level worktop 120cm wide. Available in both Black and White with 3-year Warranty. 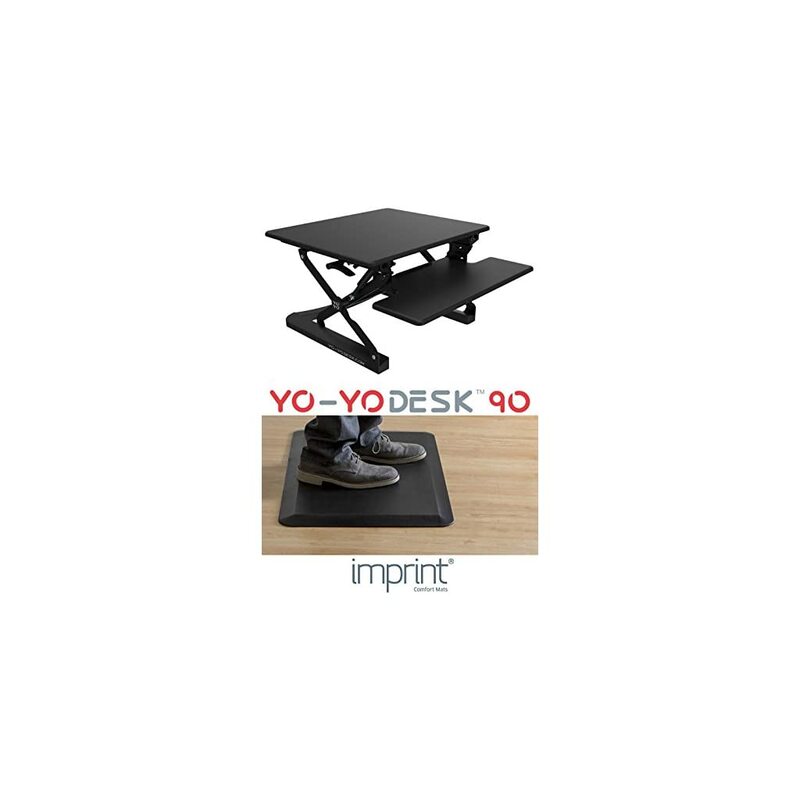 Bundle Offer – Save £30: Yo-Yo Desk 90 with Standard IMPRINT CumulusPRO comfort mat. 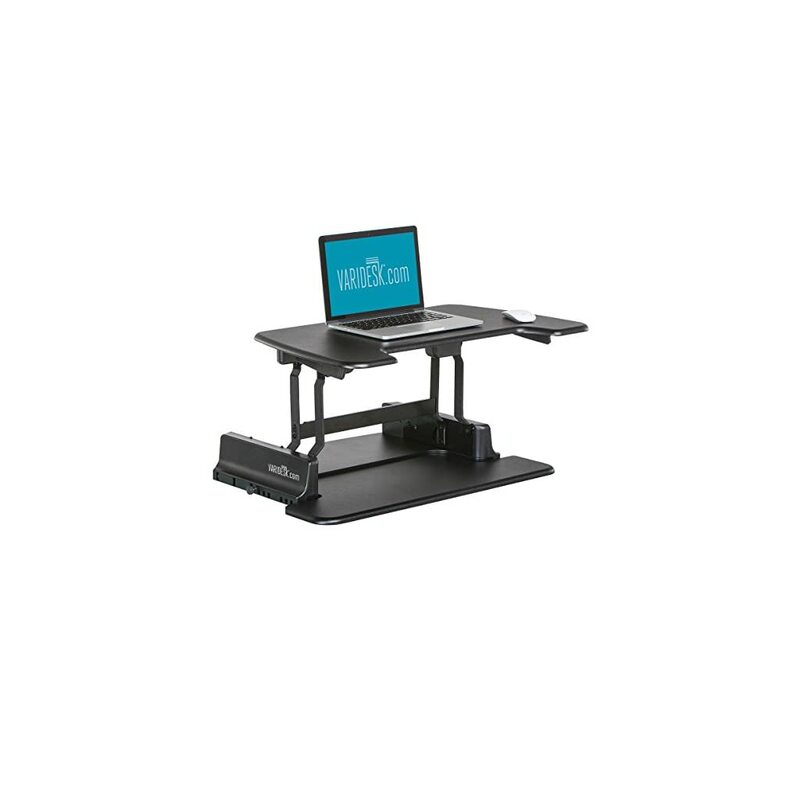 Best Selling Height Adjustable Standing Desk [90cm Wide] with award winning Standing Desk Anti-fatigue Mat (BLACK). Perfect standing desk bundle solution. 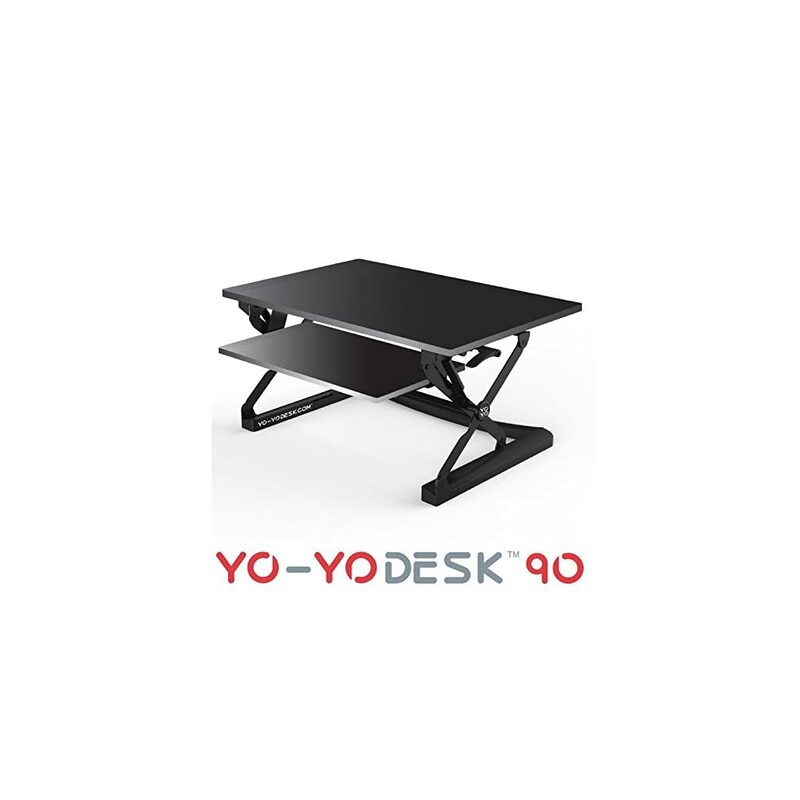 Yo-Yo Desk 90 sit-stand desk converter for easy and fast switching from sitting to standing. To encourage maximum movement and comfort whilst standing, experts recommend IMPRINT CumulusPRO standard professional grade anti-fatigue standing desk mat. 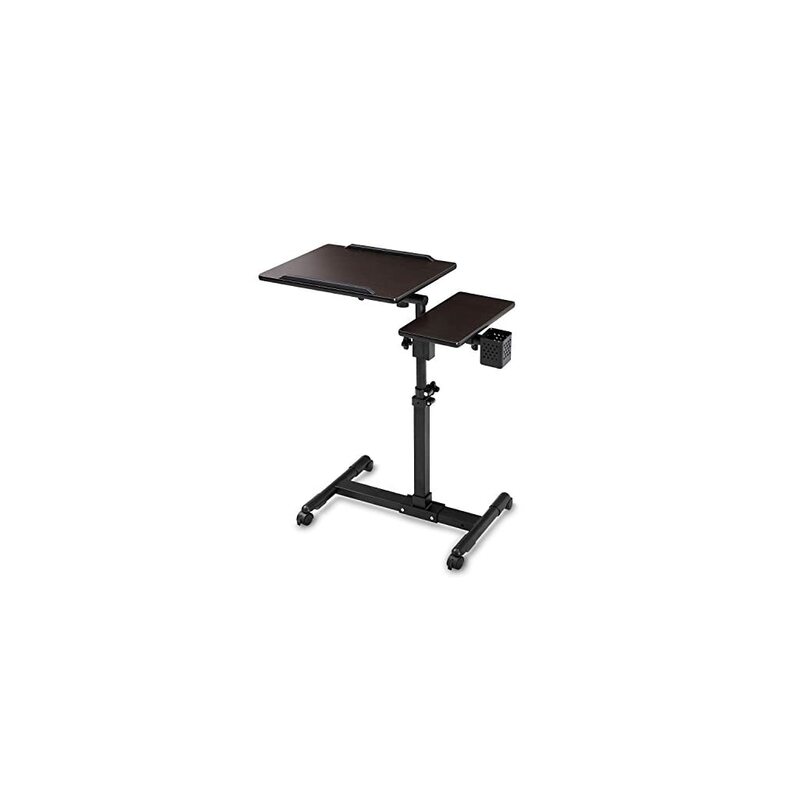 Height adjustable desk range: 50cm (Desktop) 36cm (Keyboard). 15 options for smooth height adjustment from sitting to standing desk. Split level worktop 90cm wide. 3-year Warranty. 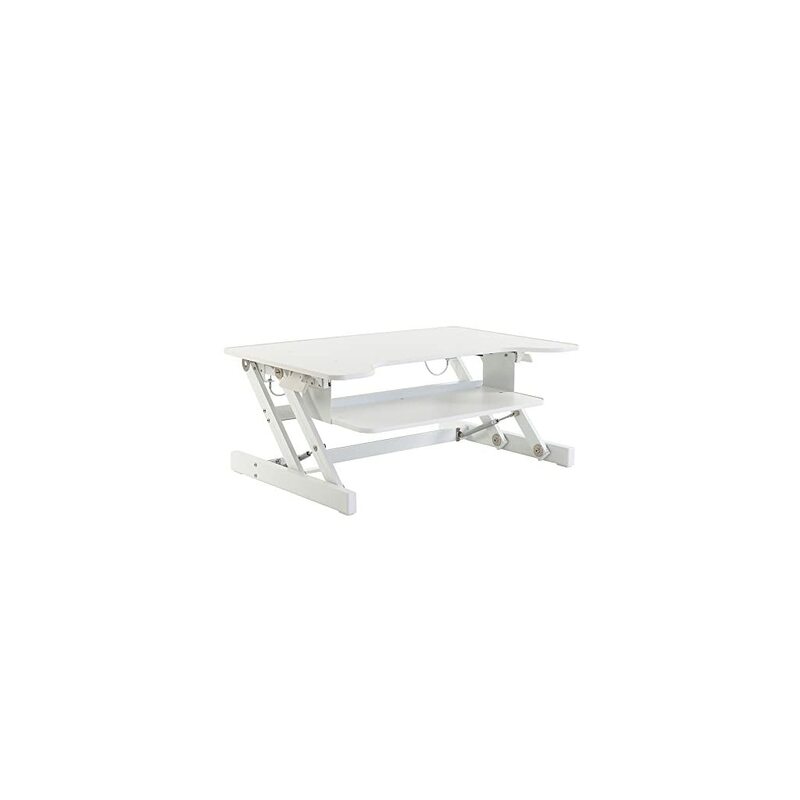 Gas Spring Sit-Stand Workstation – premium grade aluminium gas spring for smooth height adjustment. 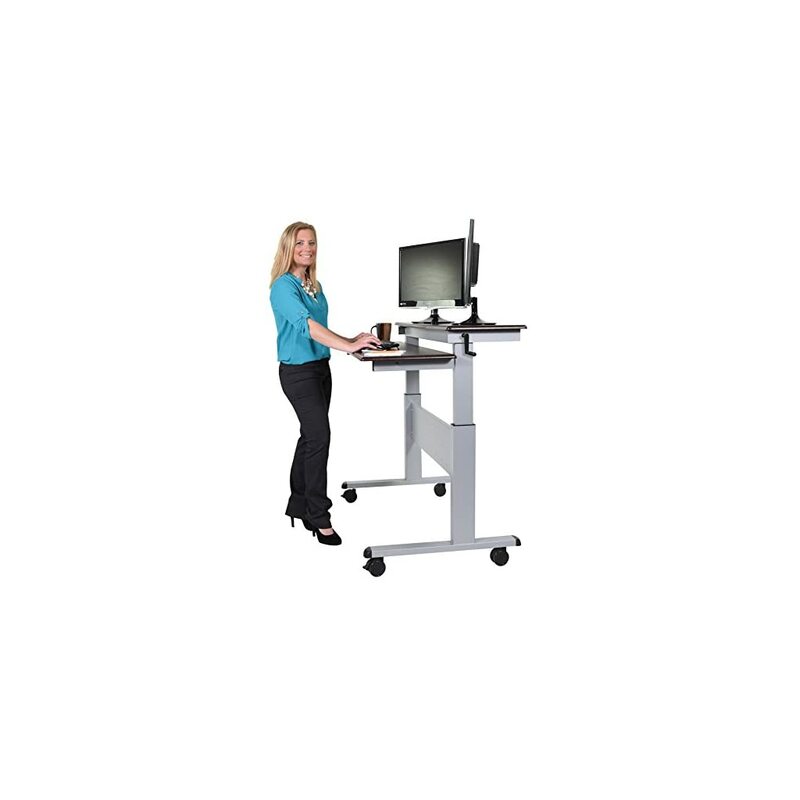 Height-adjustable Sit-Stand Workstation. Comes with FREE BALANCE CUSHION. 15 options for smooth height adjustment from sitting to standing desk. Split level worktop 68 cm wide. 15 options for smooth height adjustment from sitting to standing desk. Split level worktop 90 cm wide. TURN ANY DESK INTO A STANDING DESK: The CT-01 allows any surface to be turned into a ergonomic standing desk and back again in just a few seconds. Built using Industrial Grade Steel for the Structural Components and Premium-Quality Protected and Waxed Wood for the Desktop Surface. Each unit passes a Rigorous 20 Point Inspection before leaving the Factory and is again Inspected before it leaves our UK warehouse. ASSISTED OPERATION with 8-LOCKABLE LEVELS: The CT-01 Professional Sit-Stand Workstation is built using Gas-Strut Technology (Just like a High-End Office Chair). 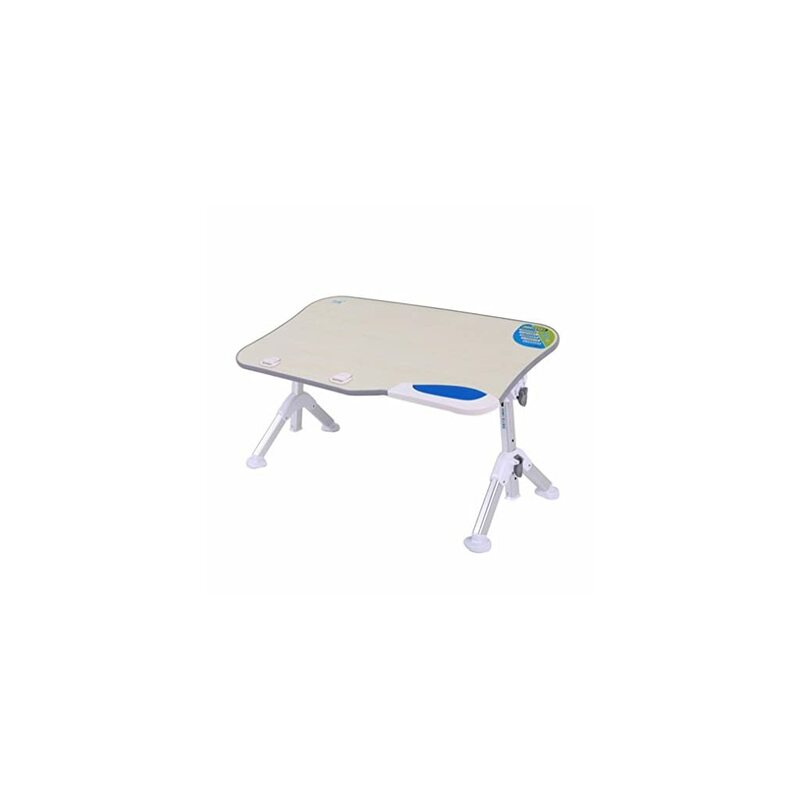 Raise and Lower with Ease, Your Desk comes pre-set for comfortable operation and can be easily adjusted by hand using easy adjust system at the rear. With is High-Quality 8-Position mechanical locking mechanism it can never fall, unlike many cable operated friction systems used in cheaper workstations. 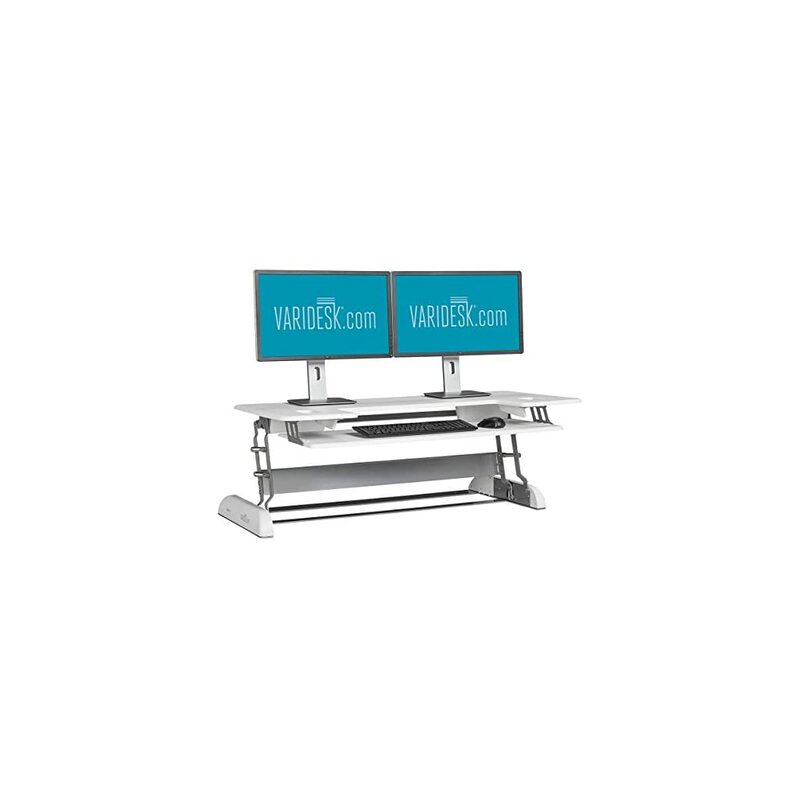 LAPTOP AND DESKTOP COMPATIBLE: The 91x56cm Desk with separate Keyboard and Mouse area is large Enough to fit two 27″ Monitors side by side (or Even More with a VESA Mount), and Plenty Big Enough for your Laptop and External Monitor. 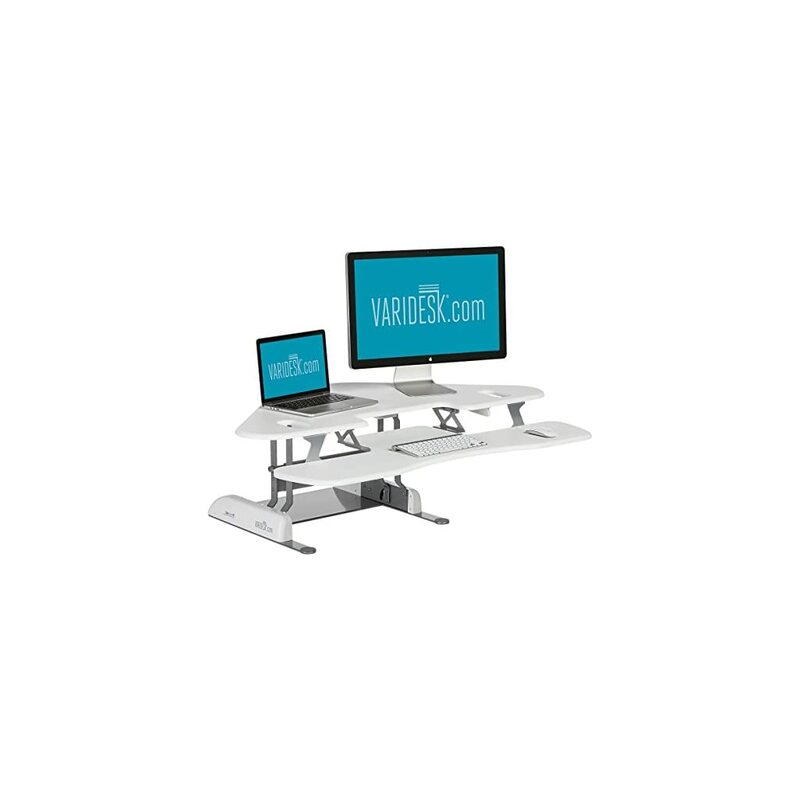 DESKTOP CONVERTER – Easy Standing Desk Solution, Which Quickly Converts a Tabletop Into a Healthy Sit-stand Workstation with Easiest Squeeze Handles to Lift-up and Push down. 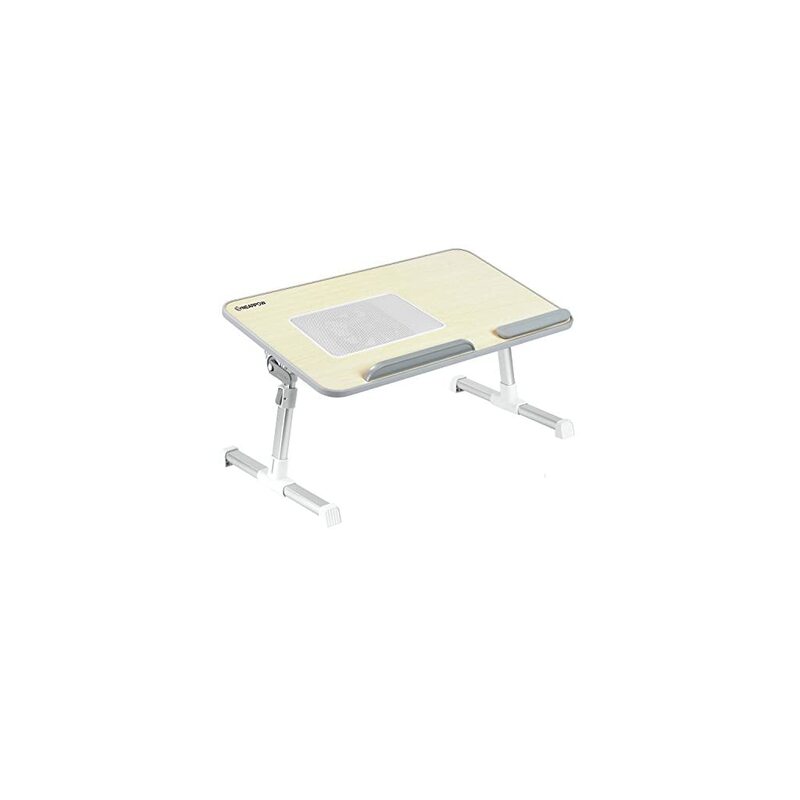 DEEPER KEYBOARD TRAY – 30 cm (11.8″) Deep Retractable Keyboard Tray for Added Arm and Wrist Comfort While Work with Keyboard/Mouse. 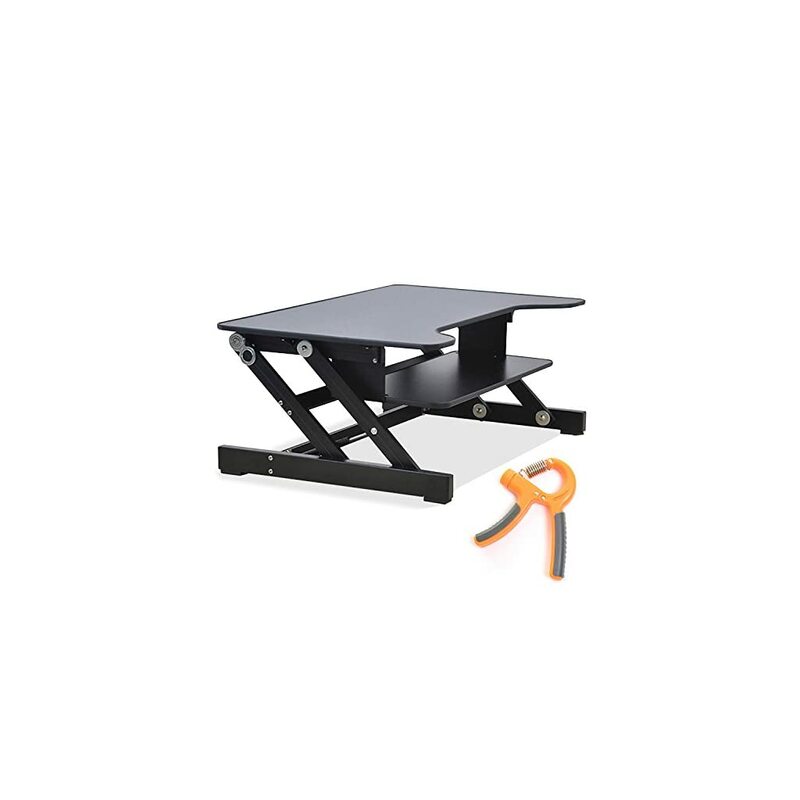 HEAVY DUTY SUPPORT & ADJUSTMENTS – Sturdy Heavy Duty Frame with Gas Spring Mechanism Supports Up to 23 kg. Adjustable Height From 16.5 cm (6.5″) to 42 cm (16.3″) Above Your Desk Surface with 4 Incremental Height Options. 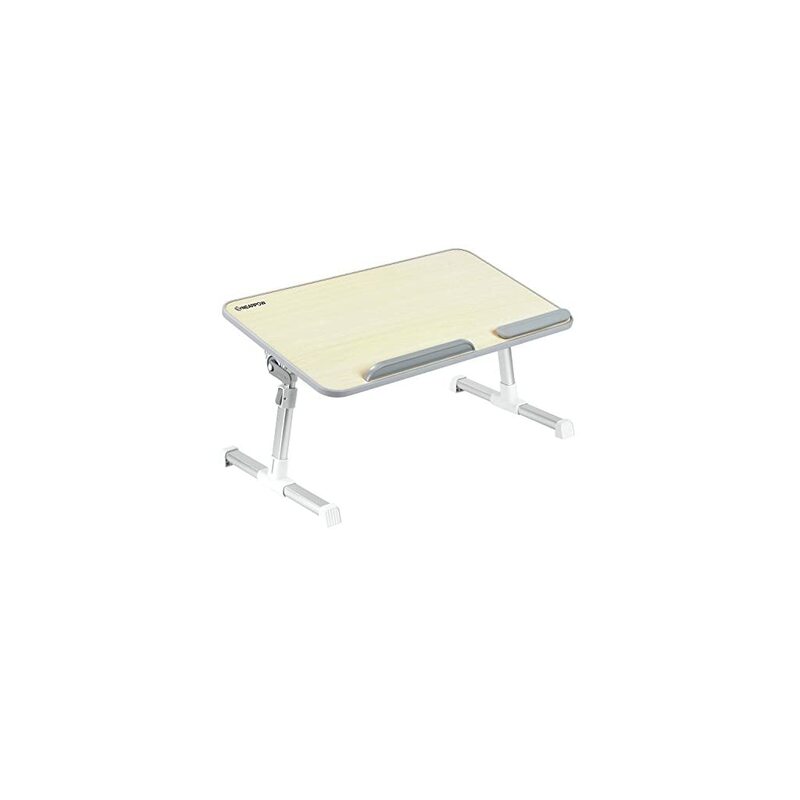 ＜ADJUSTABLE SURFACE＞-The height of the desk surface adjusts from 25.6 to 33.8in to meet your needs. ＜STABLE AND USEFUL DESIGN＞-Wood-grained laminated top with flush-mounted L-molded edge design. The large shelf design gives you plenty of work space. ＜MATERIAL＞-The welded pipes’ surface electrostatic spraying ensures years of use and avoids paint peeling, also the use of MDF achieved the goal of environmental protection. The PERFECT Adjustable Height Standing Desk Stool! Perch yourself near standing height quickly move between sitting and standing. 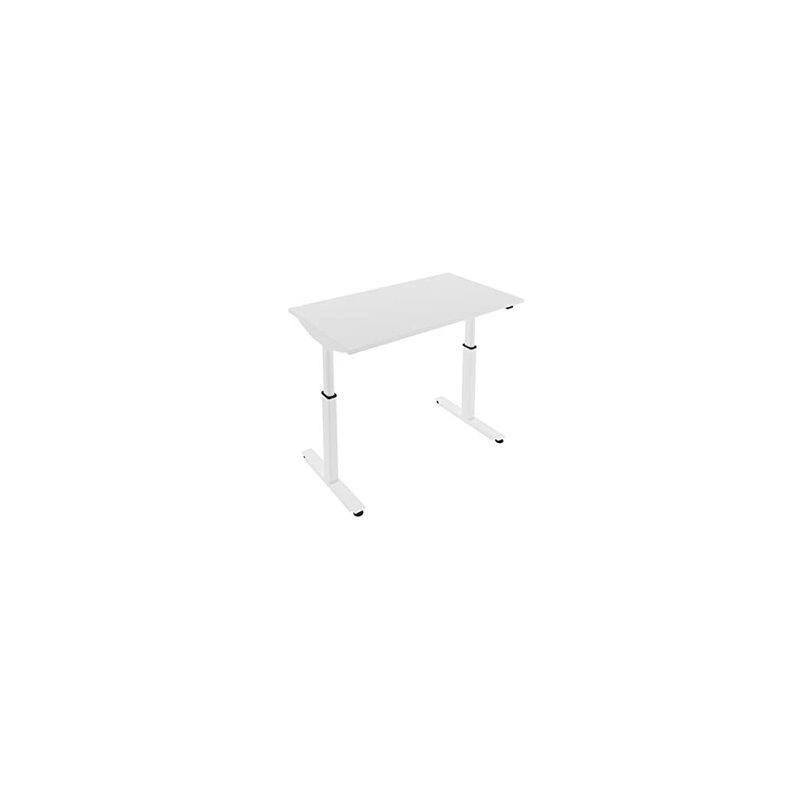 Standing Desk Electronic Height Adjustable Desk with WHITE Frame. Table Top available in various finishes. FREE Cable Tray! LIGHT BUT STURDY – It can fold flat for convenient storage, is light enough to carry around, made of 100% high quality engineered wood which is environmentally friendly, strong and durable. 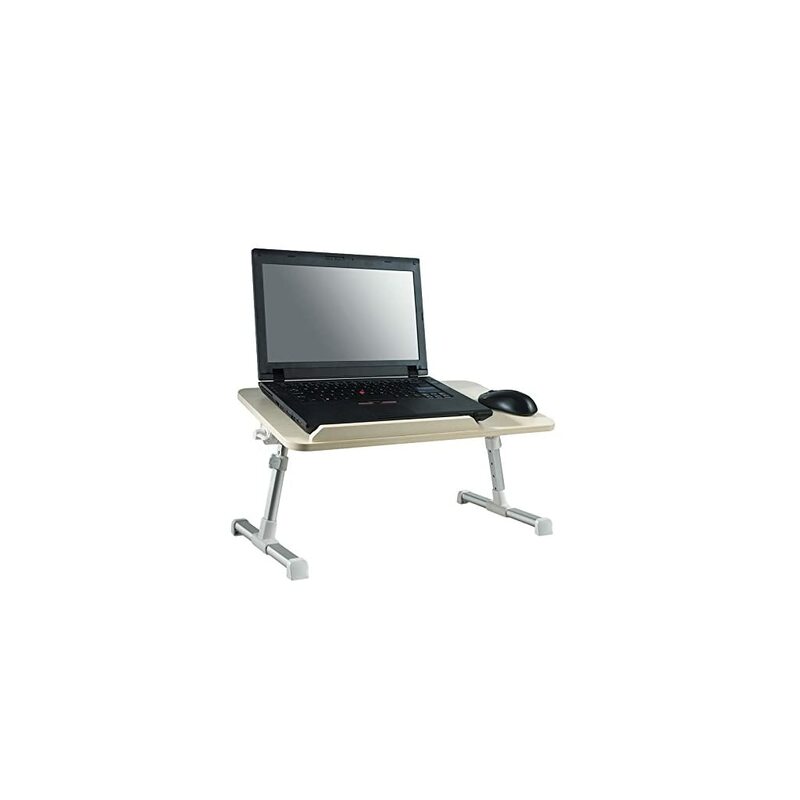 PORTABLE – You can work anywhere, simply fold the desk and you have your own ergonomic workstation ready. 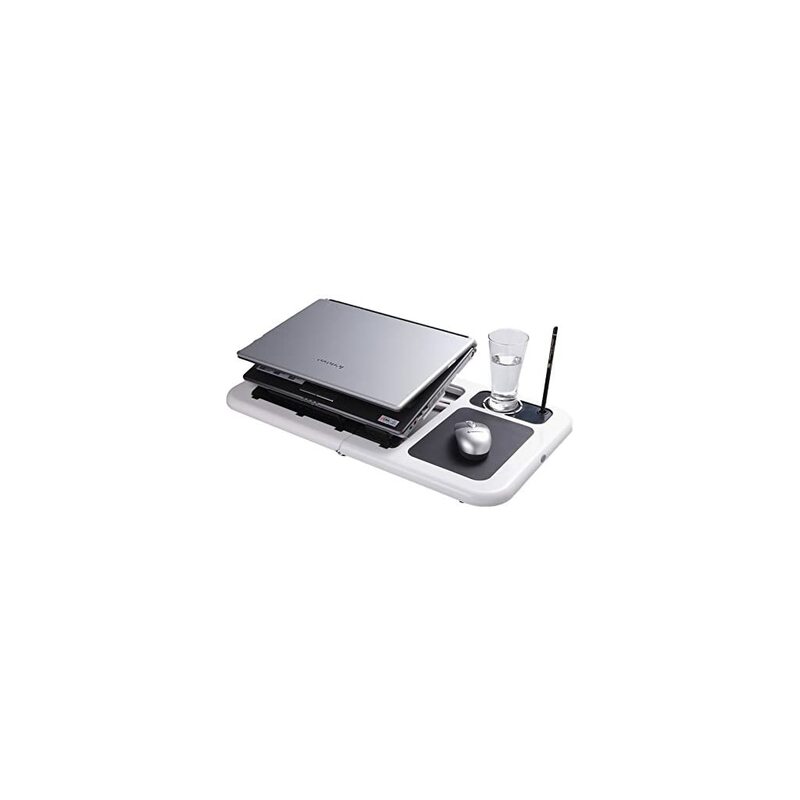 MULTI-PURPOSE – It’s a multifunctional laptop workstation, a desk stand for office work, – Sofa tray for snacking, a laptop stand whilst in bed, – or writing,drawing,book and tablet stand. 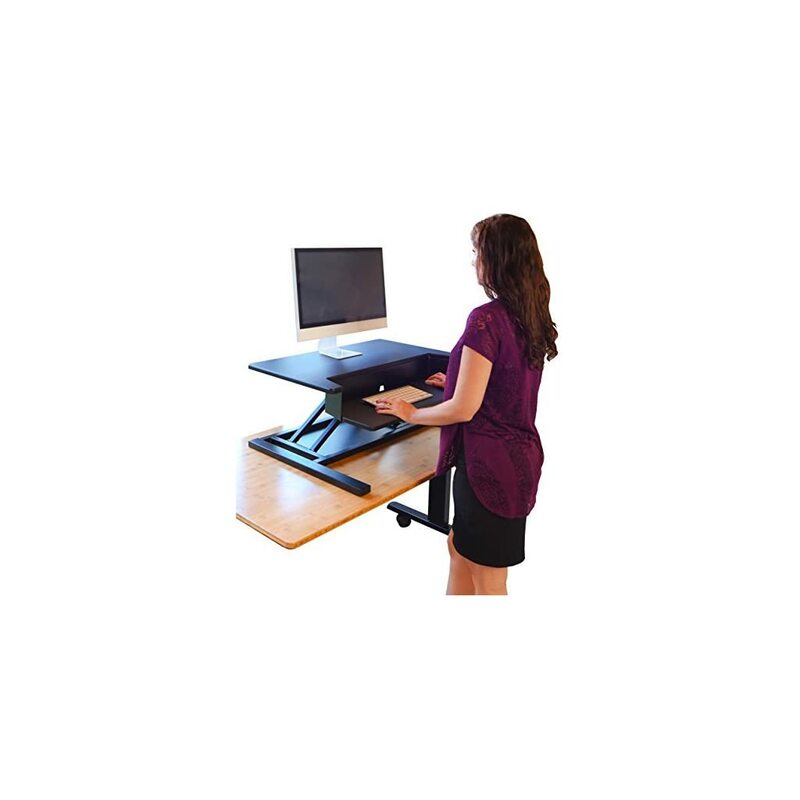 HEALTHY WORK PLACE – Use on your workplace desk so you can stand while you work; gives you a break from sitting down all day, helps back disorders such as backache, and spondylitis caused by long hours sitting in the workplace. SIMPLE TO USE – Two auto-lock buttons on each to quickly change the height (adjustable from 23.5 to 31.5cm) also 2 clamps to adjust the surface angle (UPTO 120° variation). 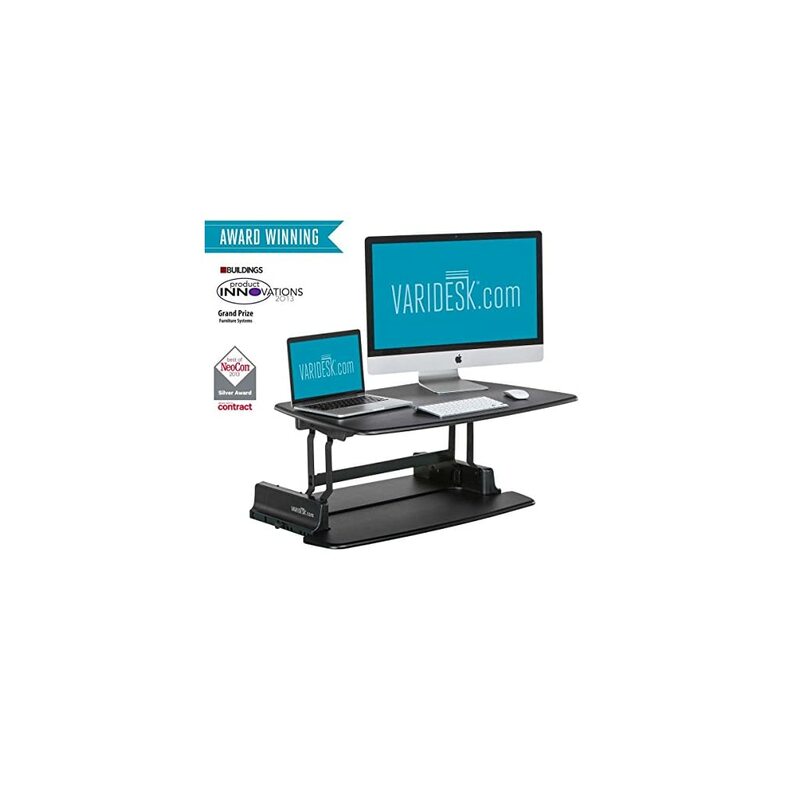 STABLE & SEAMLESS MOVEMENT: With a durable steel base and a pneumatic air cylinder for smooth raising and lowering, the AirRise is a sturdy and easily operated standing desk converter. The AirRise makes it simple to move from sit or stand throughout your workday. NO ASSEMBLY: The AirRise doesn’t require any assembly or workspace retrofitting-simply add it to your desktop and enjoy moving from sit to stand. Whether you work from home or in a traditional cubical environment, the AirRise will convert ant surface into a standing desk and can be easily moved and adjusted when necessary. AIR TECHNOLOGY: The AirRise uses innovative pneumatic technology, allowing you to adjust the height of your desk with an air cylinder. 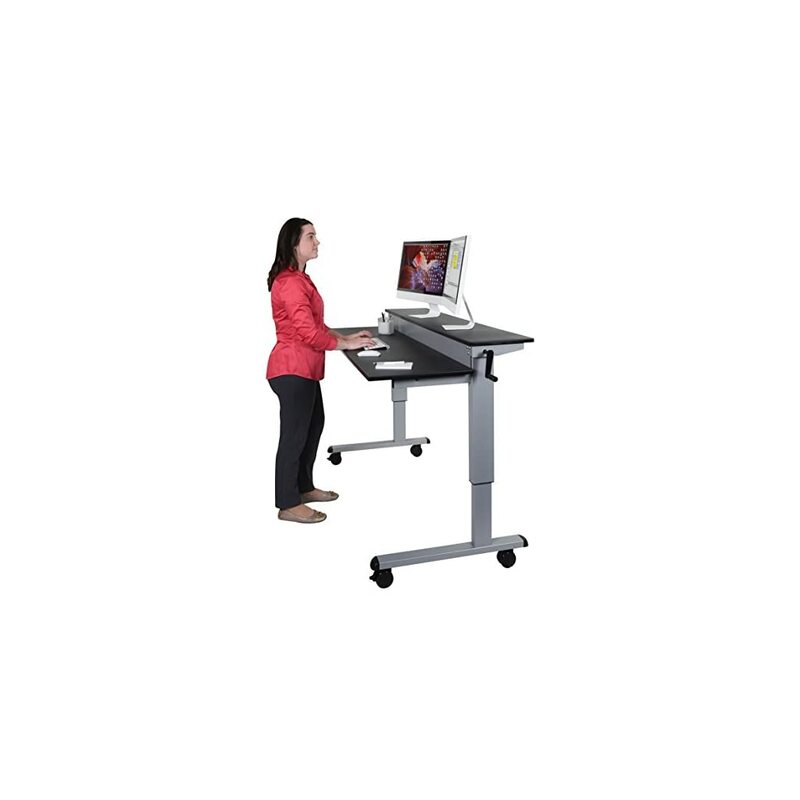 Adjust heights and rise from sit to stand in seconds. With a well-constructed steel frame and a durable 32″ desktop, the AirRise remains stable even at its maximum 15.75″ above your desk. 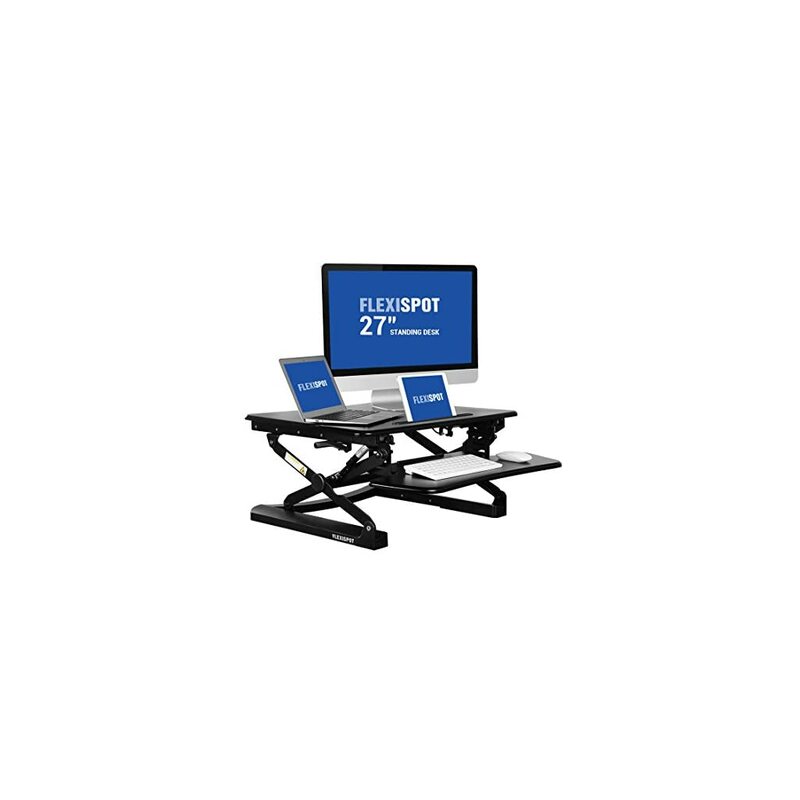 MULTIPURPOSE – It acts as a multifunctional laptop workstation, a standing desk for office work, a TV tray for snacking, a laptop bed stand for relaxing in bed, or a book / tablet stand. HEALTHIER WORKING – When used in conjunction with a regular desk it enables you to work while standing; freeing yourself from disorders such as backache, and spondylitis caused by long hours sitting in the workplace. EASY TO USE – Two auto-lock buttons on each side easily enable quick changes in height (adjustable from 25 – 32.5cm), in addition two clamps may be used to adjust the surface angle (from 0-45°). 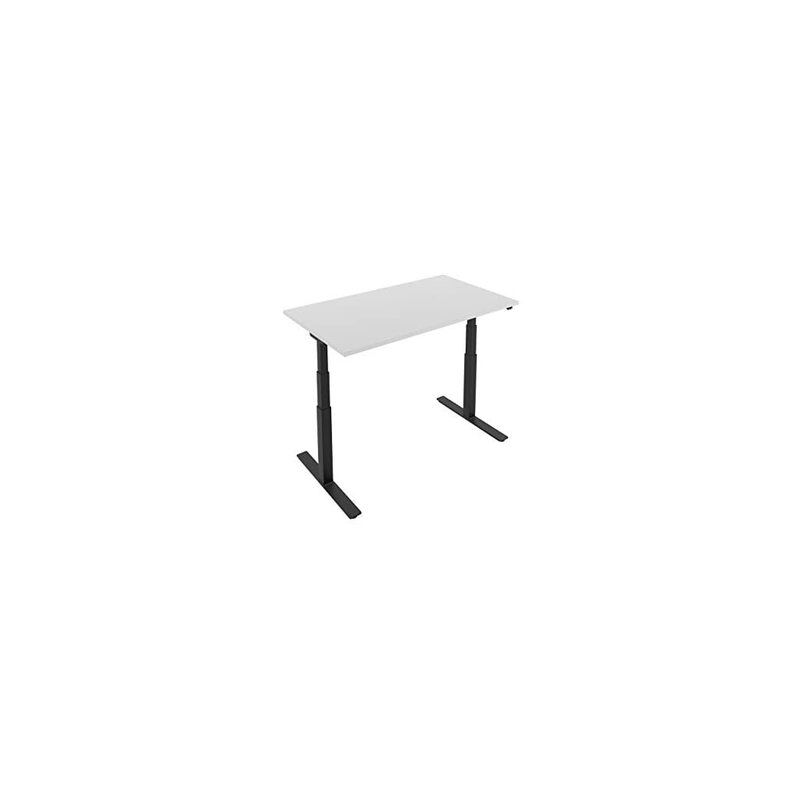 ＜ADJUSTABLE SURFACE＞-The height of the desk surface adjusts from 22.4in to 37.4in to meet your needs ( Recommend height≤ 33.5in ). The top surface can tilt degree 360. ＜USEFUL DESIGN＞-Welded tubular STEEL construction on a H-style base with 2″ swivel castors, which provides long lasting stability and easy maneuverability. The installation of radiator fan helps your computer run more steadily. ＜DURABLE AND ECO-FRIENDLY MATERIAL＞-The welded pipes’ surface electrostatic spraying ensures years of use and avoids paint peeling, also the use of MDF achieved the goal of environmental protection. It’s suitable for home, office, school, church, conference room or medical settings. 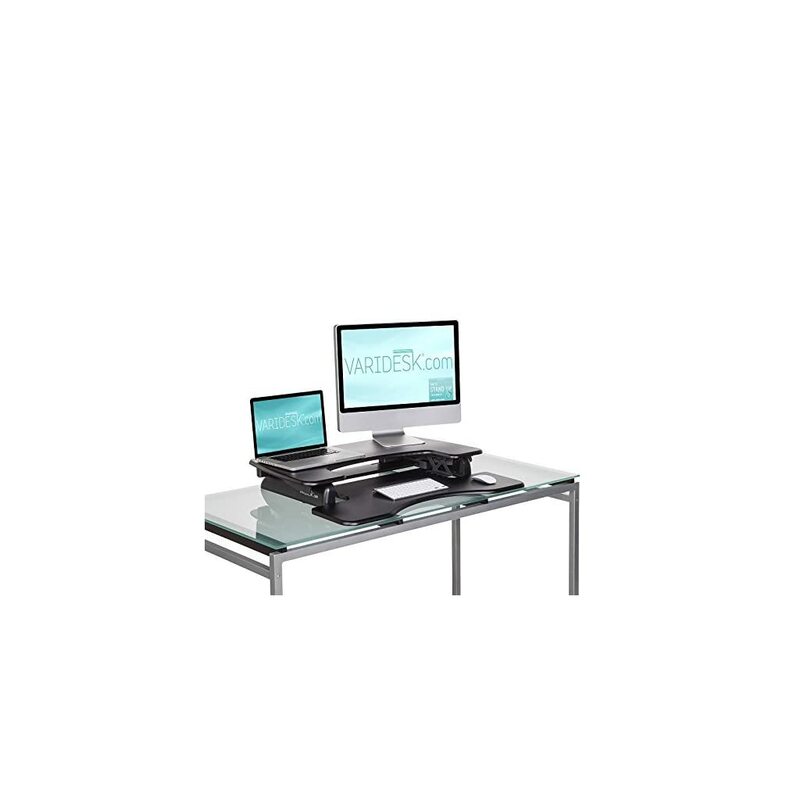 STURDY & SMOOTH MOVEMENT: The sturdy desktop is optimized to smoothly raise and lower 15 lbs. (can hold up to 50 lbs.) and easily lifts dual-monitors and laptops. 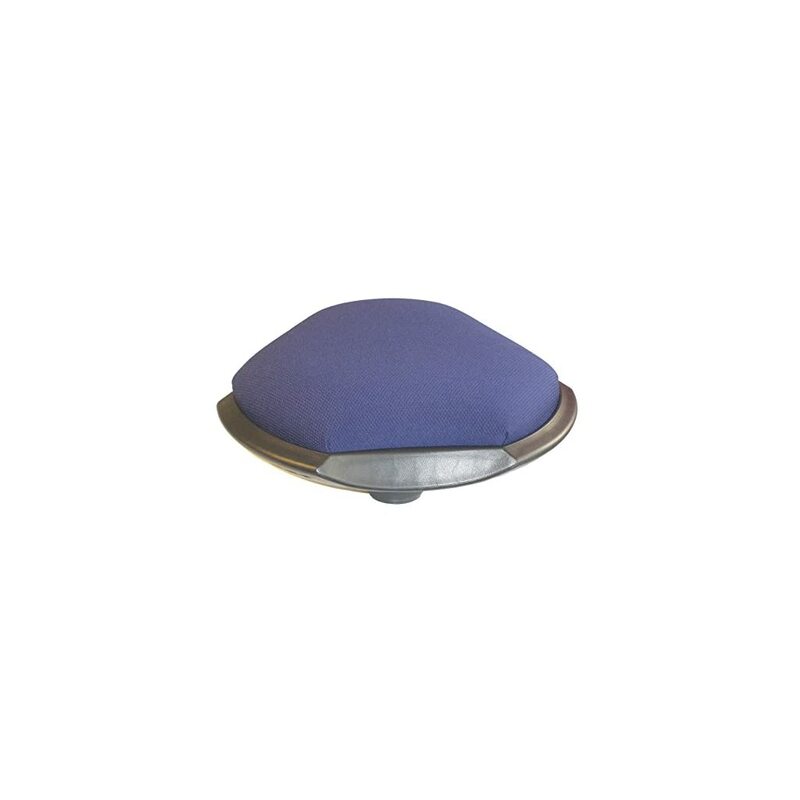 No assembly, no hassle; simply place it on a surface and smoothly adjust up and down. 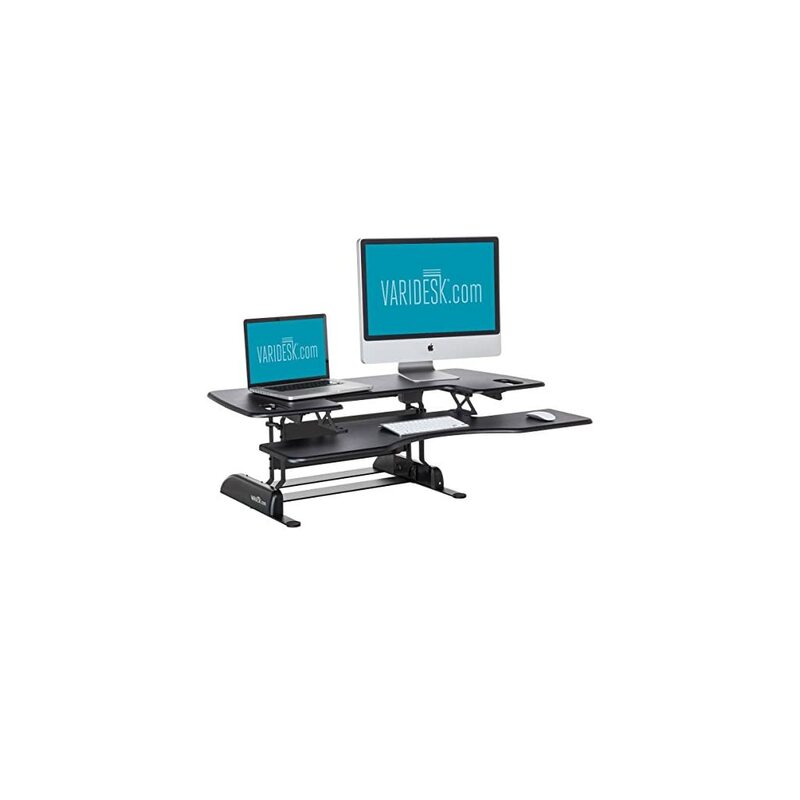 TWO-TIER DESIGN: Securely hold monitors, a laptop, or extra work accessories on the spacious 32″ top shelf, while the second shelf holds your keyboard and mouse. 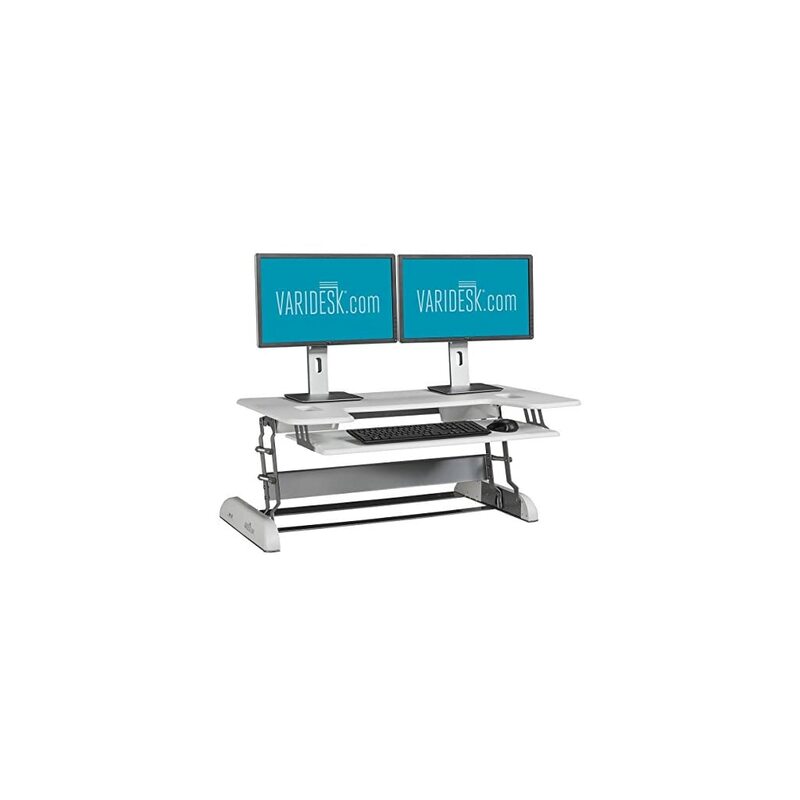 The two-tier design ensures ideal ergonomics, placing your monitors at eye level. AIR TECHNOLOGY: The AirRise Pro desktop converter is built with innovative pneumatic technology, using an air cylinder to adjust heights and rise from sit to stand in a matter of seconds. 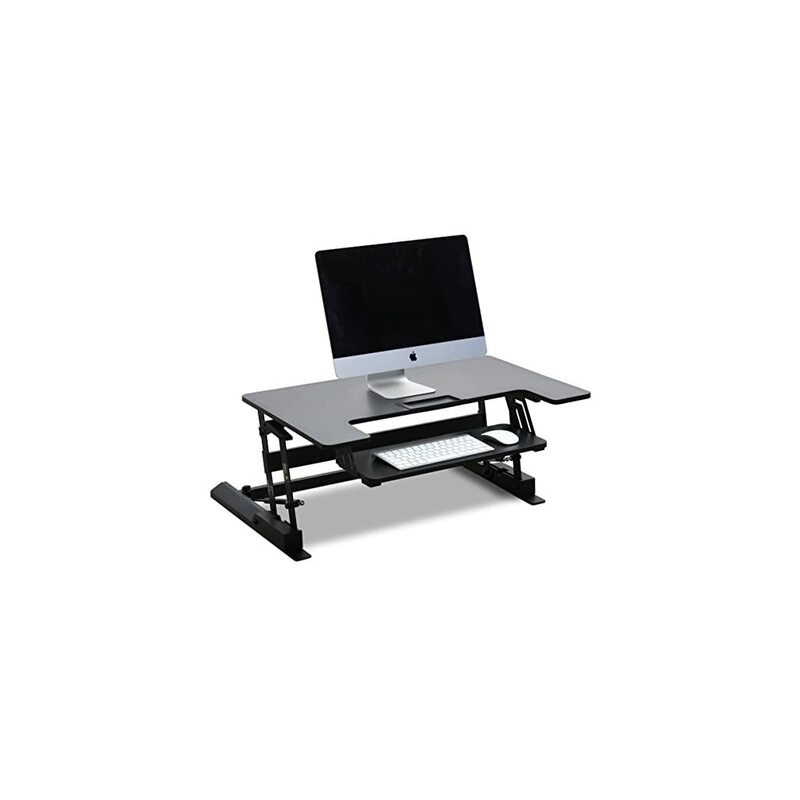 This standing desk converter does not interfere with your space, simply moving straight up and down. 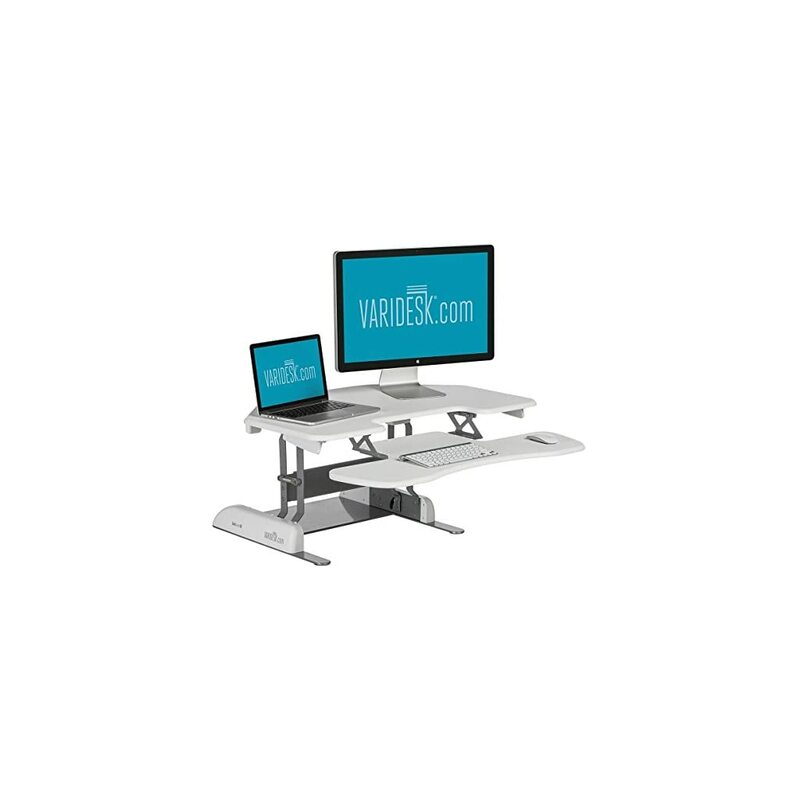 ＜ADJUSTABLE SURFACE＞-The height of the desk surface adjusts from 22.4 in to 37.4 in to meet your needs. The top surface can tilt degree 360. 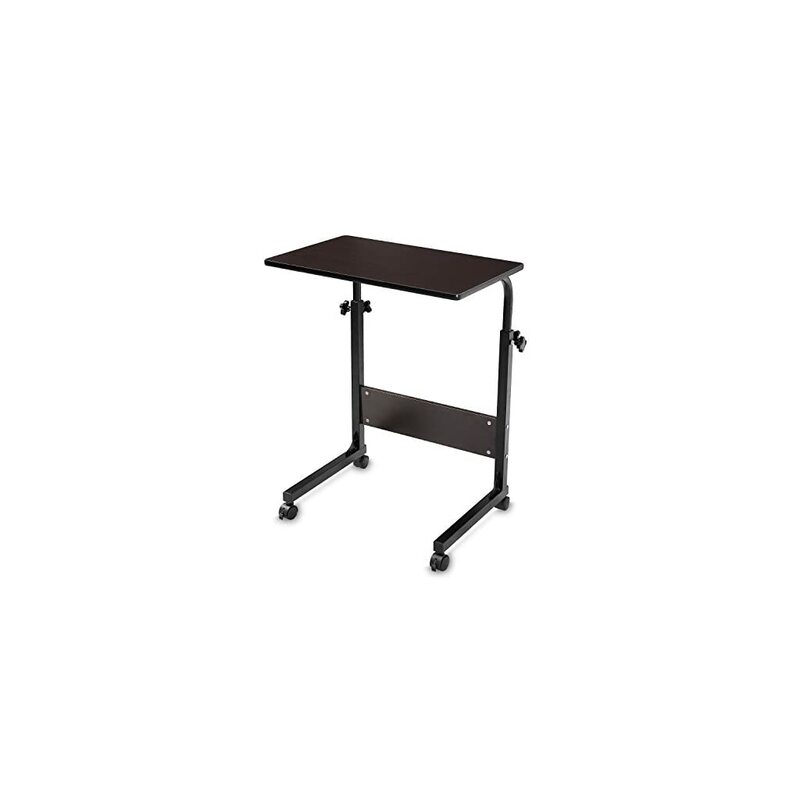 ＜DESIGN＞-Welded tubular STEEL construction on a H-style base with 2″ swivel castors, which provides long lasting stability and easy maneuverability. The installation of radiator fan helps your computer run more steadily. ＜MATERIAL＞-The welded pipes’ surface electrostatic spraying ensures years of use and avoids paint peeling, also the use of MDF achieved the goal of environmental protection. It’s suitable for home, office, school, church, conference room or medical settings. New taller height – Easily adjusts from sitting to standing with a smooth crank adjustment from 73.5-108.5cm (lower surface) and 85-120cm (upper surface).